Enjoy Food & Travel will visit Barcelona June 20th to June 27th. We have booked 7 nights at Sunotel Aston, situated in Eixample, and we look forward the stay. As we had our last experience from this great city during the christmas, we expect a much warmer stay this time, and to enjoy the outdoor swimming pool, and to enjoy the Barceloneta. 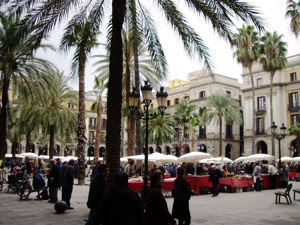 Enjoy Food & Travel will share with you new travel experiences from Catalunya. We are planning a visit to the town of Sitges, south of Barcelona, and to have our own private pilgrimage to the monastery at Montserrat, to admire the Black Madonna. And ofcourse. More food, and more wine. As we are staying in Barcelonas Gay Village (Gaixample), we also hope to do some clubbing as well.